Built 1767 by Nicolas-Henri Jardin for King Christian VII, in the first floor of the royal stables. Opened 30 Jan 1767. 1842 rebuildings. Closed 1881 due to insufficient fire safety. 1885 auction sale of the furniture and theatre equipment. 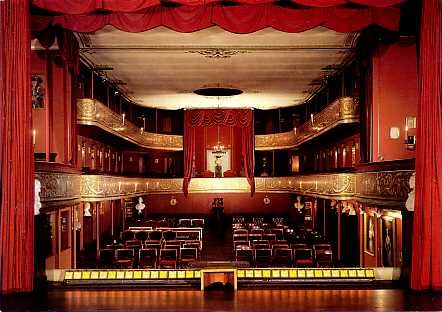 From 1922, used as Theatre Museum. Subsequently extensively restored. Front Text: "Hofteatret på Christiansborg, åbnet 1767. Tilskuerrummet efter ombygningen i 1842. The Court Theatre. The Auditorium."